Meal prep doesn't end after cooking or even plating your food. 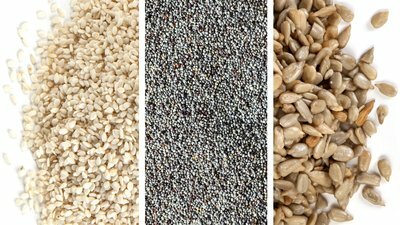 There's usually one more way you can further boost nutritional content: Add seeds. You likely have a few seeds stored in jars in the back of your cupboard, leftovers from recipes cooked months before. There they sit, still in mint condition. While you know they're good for you, it's not always easy to integrate these small nutritional powerhouses into your diet. Include generous helpings in a homemade pesto. De Lorgeril, M., & Salen, P. (2004). Alpha-linolenic acid and coronary heart disease. Nutrition, Metabolism and Cardiovascular Diseases, 14(3), 162-169.